Big Crocodile Lake (BCL) is the largest of the meromictic marine lakes. It is also one of the most remote, set in the heart of Mecherchar with no direct access. 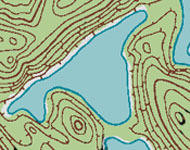 High ridges surround the lake except at three points: at the western tip (left, in picture) where it is most easily accessed, at the northeastern tip where it is separated by a low limestone platform from an L-shaped lake, and at its southern end where a 50 m thick band of mangrove leads to Crocodile Hole. Crocodile Hole may have been joined with BCL when the mangrove was less substantial, many centuries in the past. 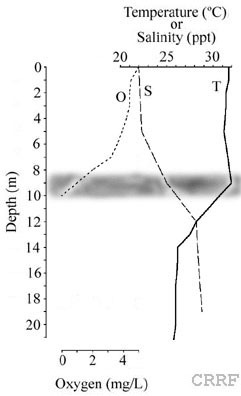 Most probably, Big Crocodile Lake, Crocodile Hole, and even L-shaped Lake were inter-connected by surface channels when sea-level was up to 5 meters higher during the Holocene. At times of much lower sea- and lake-level, however, Big Crocodile Lake, Crocodile Hole, and L-shaped Lake all must have been quite distinct, even more so than BCL and L-shaped Lake currently. As such, these lakes likely have a reticulated evolutionary history, and it is unclear what were the origins and what are the relationships of animals that inhabit the lakes, such as the moon jellyfish (Aurelia sp.). One thing is certain, the eponymous saltwater crocodiles can easily move between these lakes, as well as others farther afield. Horizontal shading indicates depth of chemocline.